📳 Ticket Only IDR.99rb ends 03 Feb 2019 🎟 Online. 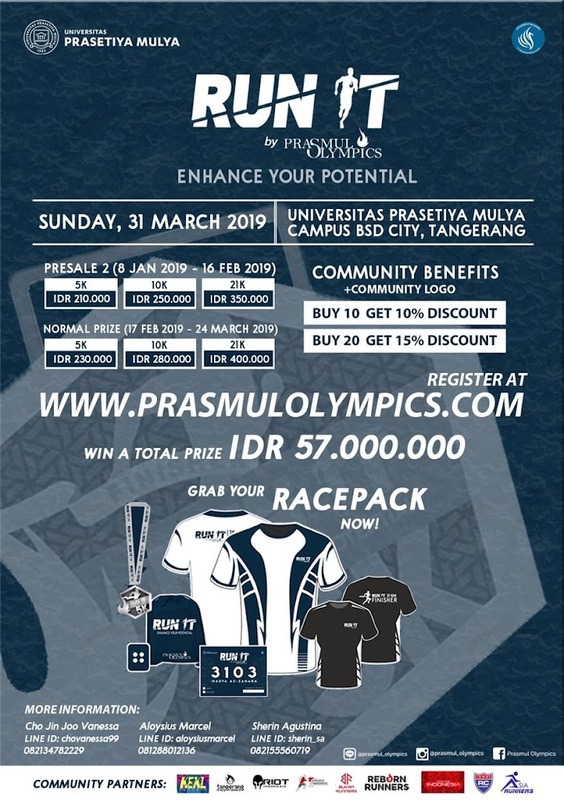 prasmulolympics∙com/..
RUN IT presented by Prasmul Olympics is running event that enhances your every motivation to run and push your limits. “Enhance your Potential” is meant by releasing/breaking down all the barriers that seems to be holding you down, and focus on enhancing the potential and ability that we are borned to achieve. We believe that everyone has the POTENTIAL to run and we support YOU to RUN IT. 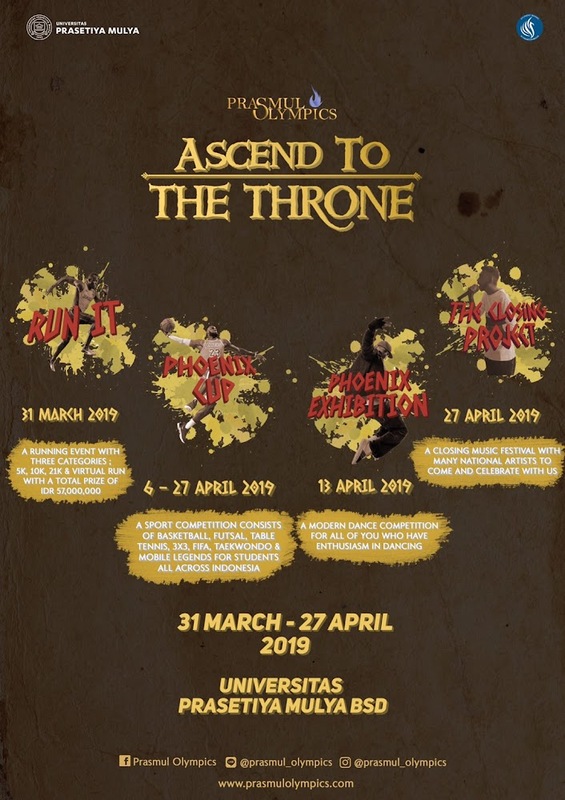 Bringing the runners the experience of 5, 10, and 21 kilometers races, RUN IT 2019 welcomes and challenges all the runners out there with hopes to unite us all together under a professional running race. RUN IT adalah yang diadakan rutin setiap tahun oleh Universitas Prasetiya Mulya BSD Campus sebagai pembuka acara PRASMUL OLYMPICS. RUN IT 2018 sukses dilaksanakan dengan jumlah peserta sebanyak 1800 runners. 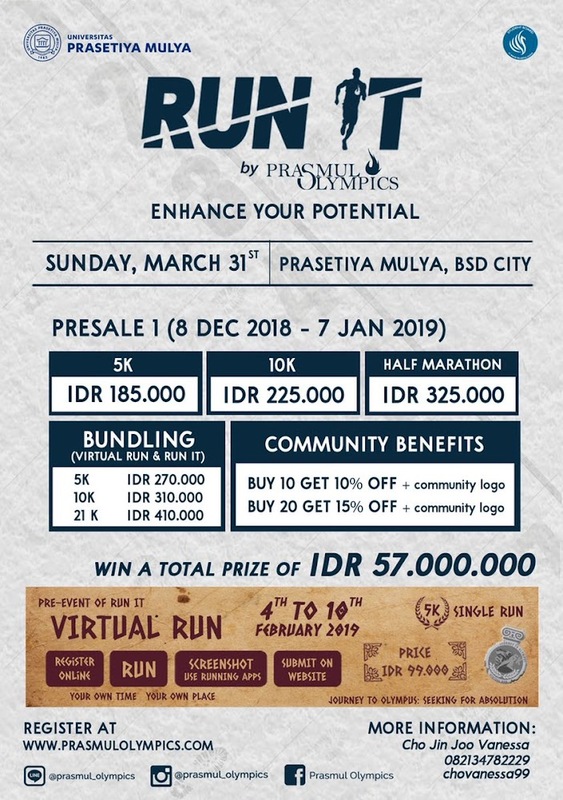 RUN IT 2019 akan dilaksanakan kembali tanggal 31 Maret 2019 dan terbuka untuk kalangan umum. Because your only limit is YOU. In RUN IT, you've been challenged by us to ENHANCE YOUR POTENTIAL. Are you brave enough to take this challenge?